China is the second largest global economic power and bordering countries are benefitting from this increased wealth. In 2009 alone 341 billion US dollars’ worth of products were imported from neighbouring countries into China (IMF, 2010). One of the products in high demand in China is rubber. Rubber is used for many products including conveyer belts and many adhesives, but mostly for car tyres. In China alone the number of cars has grown 20 fold in the past decade with 18.5 million cars sold in 2011 (Branigan, 2012). With only 3% of the 1.3 billion Chinese population owning a car at the moment (Madslien, 2012), the car industries are not expected to slow in their growth any time soon. During 2012 consumption of rubber increased by 4% with Asia consuming the biggest proportion of natural rubber (Sumernet, 2009). It has encouraged countries to invest in rubber plantations in Asia where 93% of all natural rubber is produced. In the last few decades the number and area of rubber plantations have increased rapidly. Rubber plantations are now found largely in Thailand, Indonesia and Malaysia, together accounting for 72% of all natural rubber production (ANRPC, 2010). It takes about five to eight years for the trees to mature, from when the trees can be tapped for rubber for up to 30 years. 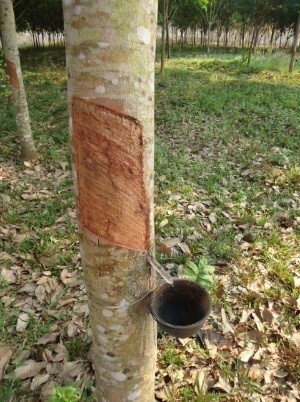 The whitish latex used for rubber production is present outside the phloem in latex vessels of the bark. These vessels are curved at a 30o angle up the tree in a right-handed spiral. This spiral makes tapping latex very difficult and requires a certain skill. A sequence of thin slices of bark are cut without damaging the growing layer. See figure 1. Every worker is able to tap between 300-450 trees per night equivalent to 1 ha of rubber plantation. Vector-borne diseases can increase or decrease due to changing land use (de Castro et al., 1999; Yasuoka and Levins, 2007). In some areas the massive clearing of the rain forest has resulted in a decrease in the typical habitat for Anopheles dirus and malaria has declined (Do Manh et al., 2010). However, tree crop plantations can provide the preferred habitat for An. dirus again with canopy cover and ample human hosts. Rubber plantations are known to be a significant site for malaria transmission (Singhasivanon et al., 1999; Yasuoka and Levins, 2007). In an area of Thailand it was estimated that 25.5% of all malaria cases were caused by work on commercial plantations, including fruit, rubber and teak plantations (Singhasivanon et al., 1999). 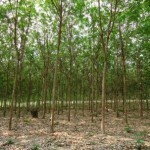 Many thousands of people are employed in the commercial forest industry, most of whom spend considerable time in and close to these tree crop plantations when An. dirus is biting. 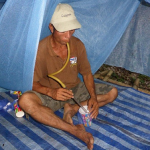 Rubber plantation tappers are expected to be most at risk as they work outdoors at night when the malaria vector is most active. In 2012 malaria incidence in the south of Lao PDR was three times as high as 2011 (WHO, 2013). This increase in malaria incidence is not well understood but could be related to the increase in rubber plantations, with malaria risk three times higher for people working in forested areas then people living in residential villages (Erhart et al., 2005). The influence of rubber plantations in Lao PDR on the spread of dengue and chikungunya remains unclear. Aedes albopictus and Ae. aegypti are known to easily adapt to new environments. In rubber plantations discarded containers used for collecting latex are common and may provide ideal breeding sites for these mosquitoes. Furthermore, depending on the vector species able to invade the rubber plantations and the proximity to forests, emerging infectious diseases could be of interest. Seasonal workers at the plantations could create a whole new dynamic to the vector-borne diseases in the plantations. 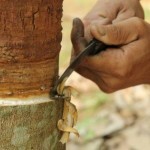 Currently 37,500 people work on rubber plantations in Lao PDR of which 95.4% are Lao (NAFRI, 2011). The increase in rubber plantations in the coming decade is expected to create work for another 177,700 people. This will increase the need for seasonal workers from other areas. These temporary workers may not have immunity against the local diseases and are more likely to develop serious adverse effects. Additionally, these workers can spread the disease when they travel to areas where the vectors are already established. Even more worrying is the possibility to introduce a drug resistant strain, like ACT resistance, in an area by either returning home with a resistant strain or transporting the resistant strain to the place of work. It is suggested that the presence of high numbers of different vector mosquitoes combined with the increase in seasonal rubber workers and their high exposure to the vector mosquitoes is creating a ‘perfect storm’ in and around rubber plantations for future disease outbreaks. 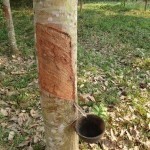 The area of land cultivated for rubber is expanding rapidly in Lao PDR. We anticipate that the changes in ecology from primary and secondary rainforest, to rubber cultivation and the maturation of these rubber trees is likely to result in an altered risk from vector-borne diseases; predominantly malaria, dengue and chikungunya. It is envisaged that this study will provide an opportunity to understand the vector ecology in rubber plantations and be able to advise organizations on how to decrease vector-borne disease incidence. This study will be of relevance to public health workers, governments and those working in the rubber industries of Lao PDR and other countries in SEA. All methods were approved by the Lao Ethics committee and Durham University ethics committee. The comparison study was also discussed with the CORC-ethics committee of Institut Pasteur and approved. To understand the ecology of the mosquitoes in the rubber plantations, we compared the mosquito number and diversity of the plantation with the forest and village for one year. Last year we established three areas of around 4km2 in Luang Prabang province, in bordering Nan and Xieng Ngeun distict where the following four habitats were present. 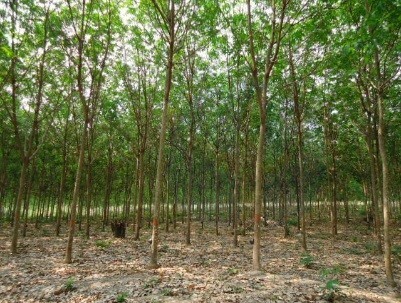 ; immature rubber plantation, mature rubber plantation, village and forest. The villages consist of Lao Loum and a mix of minorities including Khamou, Yao and Hmong. We collected mosquitoes in the different habitats using the double bednet collection method which does not expose participants to mosquitoes. 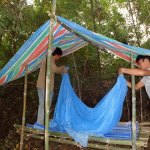 The double netting method entails the use of a small net covering the participant and a larger net covering the smaller net with a gap of 30cm at the bottom. Mosquitoes are attracted to the presence of the participant and fly towards them, mostly flying low to the ground. These mosquitoes encounter the smaller bednet and try to gain access by flying up. They are now in between the two bednets and will have difficulty escaping. See figure 2. Every hour the participant within the net collects all the mosquitoes in between the two bednets and puts them in a collecting cup. In 2013 we sampled mosquitoes with three participants every hour for two days and two nights in the three study areas every month from July to November. In 2014 this was carried out every two months from January to July. We therefore collected data on the density and diversity of mosquitoes every hour, both day and night, every month in all four habitats. With these data we can analyse the behaviour of mosquito species attracted to humans and their abundance in the different habitats. A total of 3888 hours of data were collected in each habitat during the collection period of 2013-2014. For possible implementation of vector control methods in the future, it is of vital importance to understand the resistance status of the important vector mosquitoes. As Anopheles species were too low for good resistance analysis and malaria cases were not found in our study area, we focussed on the dengue vector Ae. albopictus. 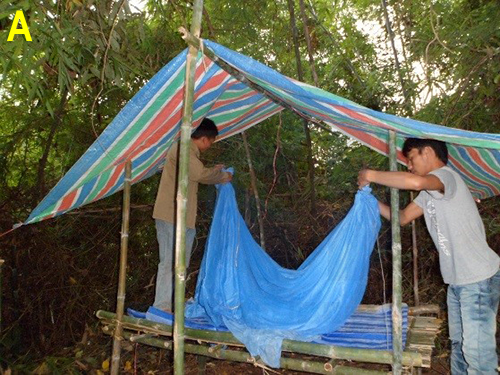 These mosquitoes were collected from the secondary forest in Village Thin Keo by villagers using the double netting method. Two participants collected mosquitoes in the forest for three consecutive days in 6 different months, both in 2013 and 2014. These mosquitoes were exposed to insecticides in WHO tubes for one hour in our field laboratory. Knock down and mortality was noted. The insecticides used were DDT (4%), permethrin (0.75), Deltamethrin (0.05%) and Malathion (5%). We also collected larvae of Ae. albopictus and Armigeres kesseli mosquitoes from the rubber plantation area. The Aedes larvae are currently reared in the insectary for large numbers. After a sufficient number of generations the female mosquitoes will be exposed to the same insecticides as the wild caught mosquitoes. These mosquitoes will be of a known age and are therefore standardized. The Armigeres larvae, which are suggested to be possible vectors for some arboviral diseases, were reared in our field laboratory with 4-6 days old non-blood fed females exposed to the insecticides. 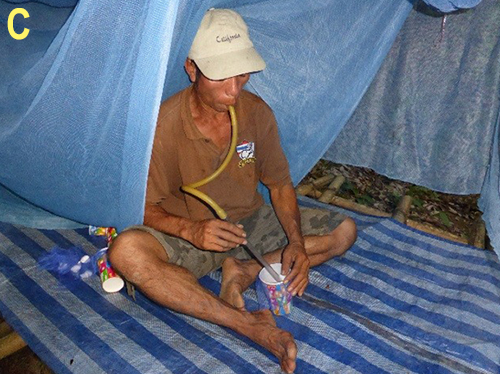 To understand where mosquitoes breed in the rubber plantations, a preliminary survey was conducted in 2013. Using this information an extensive Standard Operation Procedure (SOP) was written. This SOP details all the steps to be taken during the survey. A systematic approach is used to identify all water bodies. Data on water quality of all identified water bodies, their size, turbidity, location, presence of mosquito larvae and more are noted. Mosquito larvae are collected and reared at the field laboratory for identification purpose. 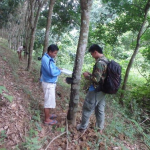 Surveys are conducted monthly in villages, mature and immature rubber plantations of all three study areas with the help of two villagers. See figure 3. The survey was started in August 2014 and is currently still taking place. 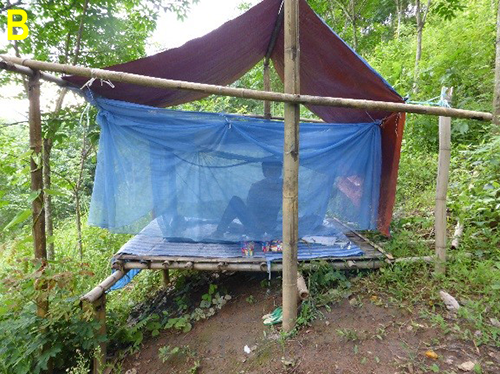 For further entomological surveys in rural areas of Laos it is important to understand the benefits and costs of different surveying methods, especially when human participants are used. Many different trapping methods are possible for surveys, including the CDC light trap, the BG sentinel trap and the Suna trap. In 2013 we already showed that the double bednet method collected a larger diversity and higher number of mosquitoes then all the electric traps. 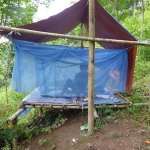 This year we compared the double bednet method with the Human Landing Catches (HLC) method which is considered the gold standard method for collecting mosquitoes. We have just concluded this study and are in the middle of our analysis. No concrete results are available yet. We have had several important meetings with key people from the village, district and province throughout this year. Apart from these regular meetings we wanted to further communicate our project goals towards our stakeholders in Lao PDR and across the border. We therefore organized a national stakeholders meeting in Vientiane to which important representatives of health, agriculture, industry, government of Lao PDR were invited. Furthermore we gave a presentation of our project at the 2014 international conference on rubber in Thailand which was attended by international health, agriculture and industry representatives, and government officials of Thailand. Ms Julie Anne Tangena received an award at the conference for ‘outstanding oral presentation’. Apart from communication with our stakeholders we also shared our project and the dangers of mosquitoes with villagers from our study area. We distributed stickers, flyers and posters provided by the Ministry of Health to the villagers showing the dangers of dengue and how to decrease the mosquito breeding sites. Furthermore, we talked to young students at their school to explain the dangers of mosquitoes and the importance of cleaning garbage. 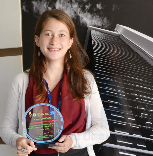 Ms Julie Anne Tangena received an award at the conference for ‘outstanding oral presentation’. We will continue our work in the field, do the molecular analysis on mosquitoes collected in our longitudinal study and analyse data collected in the field this year. Focus in the next few months will be on re-identifying and confirming the species collected during our longitudinal study to ensure we are confident with the high diversity of mosquitoes found. Furthermore, we will pin 10 mosquitoes of each species found in our study site for future reference and place them in the ‘IP Laos’ collection of medically important arthropods. The molecular analysis will take place in Vientiane for viral detection and in Bangkok for species identification. We will continue surveying the rubber plantations and the villages for larval breeding sites and continue our resistance test. 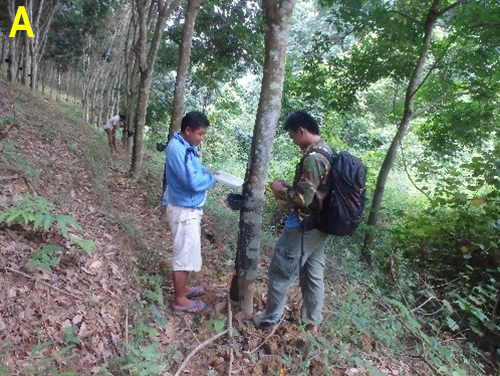 We will additionally measure important environmental factors in the three different forested areas with the help of the National Agriculture and Forestry Research Institute (NAFRI); immature rubber plantation, mature rubber plantation and secondary forest. This information will be used for all our comparison data to distinguish the different habitats from each other. 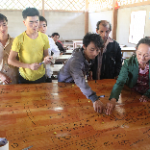 We will also have short group discussions with the rubber workers in our rubber plantations to have both an opportunity to share information on our preliminary findings and discuss their problems with mosquitoes, their methods of prevention and how they would like to be helped. In the long term, emphasis will be on analyzing all the data collected during the 2013 and 2014 field periods to be able to share clear conclusions with the stakeholders. We will be working closely together with NAFRI and the ministry of health to identify how to communicate and implement our findings and recommendations concerning the vector-borne disease risks for the people working in and around the rubber plantations. ANRPC Natural Rubber Trends & Statistics. 2010. 2.
orth-central Vietnam. Malar J, 2010. 9(1): p. 259. Erhart, A., et al., Epidemiology of forest malaria in central Vietnam: a large scale cross-sectional survey. Malaria Journal, 2005. 4(58). Hurni, K., Rubber in Laos, detection of actual and assessment of potential plantations in Lao PDR using GIS and remote sensing technologies, in Centre for Development and Environment2008, University of Bern. IMF, World economic Outlook: Recovery, risk and rebalancing, I.M. Funds, Editor 2010. Li, Z. and J.M. Fox, Mapping rubber tree growth in mainland Southeast Asia using time-series MODIS 250 m NDVI and statistical data. Applied Geography, 2012. 32: p. 420-432. Madslien, J. China’s car market matures after ultra-fast growth. 2012. NAFRI, Review of rubber plantations M.o.a.a.f. National agriculture and Forestry Research Institute, Editor 2011: Vientiane. Singhasivanon, P., et al., Malaria in tree crop plantations in south-eastern and western provinces of Thailand. Southeast Asian Journal of Tropical Medicine and Public Health, 1999. 30(3): p. 399-404. 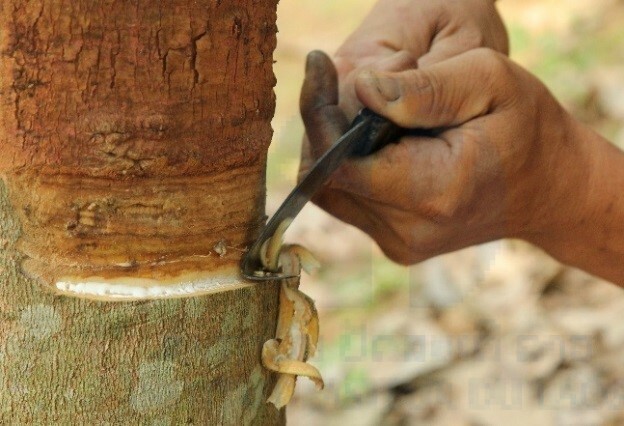 Sumernet, Discussion paper: rubber investment and market linkages in Lao PDR: approaches of sustainability, S.M.R. Network, Editor 2009.
asuoka, J. and R. Levins, Impact of deforestation and agricultural development on anopheline ecology and malaria epidemiology. American society of tropical medicine and hygiene, 2007. 76(3): p. 450-460.
WHO, malaria epidemic in south of Lao PDR, 2013.